'Cars 3' Comes Roaring Back With A Swapped-Out (Story) Engine A franchise many worried was running on fumes finds more fuel in the tank thanks to a new director, dazzling set-pieces and a fresh take on themes of aging and mentorship. 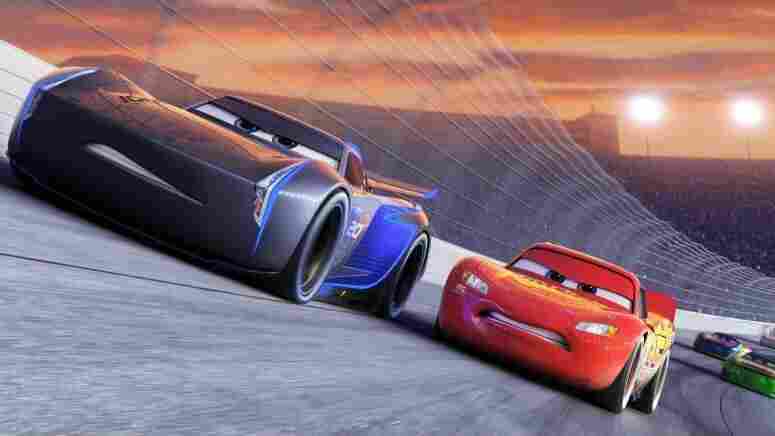 Jackson Storm (Armie Hammer) and Lightning McQueen (Owen Wilson) in Cars. The multi-billion-dollar success of Pixar's Cars series can be chalked up to a great many things, but don't discount the little vroom-vroom frowns the cars make with their dashboard eyes when they want to go fast. When Lightning McQueen, the Owen Wilson-voiced stock car with the bright flames decal, guns for pole position, he squints so much that any human who might be driving him wouldn't be able to see the road. But of course there are no humans in this world, unless you count the invisible giant kids who must be steering the racers with their hands and making the motor sounds themselves. That enduring childhood (typically but by no means exclusively boyhood) fascination with moving vehicles has propped up this franchise for the backseat set, seeing it through three feature-length films, a spin-off Planes series, and countless toy tie-ins. Cars has helped secure Pixar's financial dominance, even as the company's recent over-reliance on easily marketable sequels has caused it to lose some trophies of its own. But after more than two decades of restless invention, followed by a recent round of "places" (The Good Dinosaur, Finding Dory) instead of the "wins" of yore, perhaps John Lasseter and Co. have started to pause and reflect on their limitations in the limelight. Thankfully, Cars 3, the first in the series to be made without Lasseter writing or directing, is not the sign of a slow death—even if its story may suggest as much. The film toys with a certain degree of "auto"-biography. Here, McQueen finds his ol' motor isn't running like it used to, as younger, more technologically savvy upstarts led by Armie Hammer's sleek, sneering Jackson Storm start squeezing him out of the winner's circle. His longtime sponsor, Rust-Eze, gets bought out by a giant conglomerate whose CEO, a shiny coupe voiced by Nathan Fillion, pushes his star to slap his grinning metal hood on every product he can find—shades of Disney purchasing Pixar in 2006. Plus, his buddy Mater (Larry the Cable Guy), the gap-toothed tow truck who "dad-gum"'ed his way to the starring role in Cars 2, is barely around. Strangely, no one seems too broken up about it. McQueen's efforts to rebuild himself on the racing circuit give him a chance to pause and reflect on the lessons he learned in the first Cars, when Paul Newman's sage Doc Hudson and the laid-back residents of forgotten Route 66 town Radiator Springs taught him there was more to life than going full-throttle. In accordance, this time around McQueen becomes the father figure Hudson was to him. He gets assigned to a trainer, the perky yellow Cruz Ramirez (Cristela Alonzo), who once harbored racing aspirations of her own but lacked "confidence" (a codeword in this male-dominated gearhead sport). Only gradually does McQueen realize that, in fact, he's training her. The best parts of Cars 3 are the ones that embrace the passage of time and the joys of mentorship, as they are the bits most likely to remind you how Pixar can deliver meaningful messages of aging and acceptance—when it wants to. Helmer Brian Fee, making his directing debut after working as a storyboard artist on past studio greats like WALL-E and Ratatouille, effectively keeps us thinking about these themes throughout McQueen's journey. He also delivers some sequences that are among the most stunning animations the company has ever produced: a breathtaking beach race at dusk; a demolition derby in which it's only a matter of time before everything is caked with mud; and a weathered filmstrip of Doc's old races that makes you wonder how hard it must be for next-gen tech to make something look convincingly "old". Yet Fee is clearly getting instructions radioed in from the Disney pit crew, so while the third Cars lap is an improvement over the zero-depth spy spoofery of the second film, it's not very convincing when it tries to peddle the sense of an ending. Of course, in retrospect, Toy Story 3 feels less profound now that we know there's a fourth outing on the way. Meanwhile, we have our best scientists still puzzling out the logistics of the Cars universe. In this film the four-wheeled ones put on headsets and use duct tape, and at one point, Mack the Mack truck (John Ratzenberger) somehow knocks on the inside of himself. And then there are the larger social problems creeping in, like the fact that gender- and race-based discrimination still exists even without any physical signs that the cars are different genders or races. Perhaps it's a metaphor for the small flickers of human error that persist in a land ruled by post-human vehicles. Or maybe all will be revealed once we're racing each other with our own sets of Cars cars. Vroom-vroom. A NOTE ON THE PRESHOW: In "Lou," a playground lost-and-found box comes alive and teaches a lesson to a school bully who likes to mess with other kids' things. It's sweet and silly, if a bit reminiscent of the famous scene in Toy Story where the toys confront Sid. Among the modern crop of Pixar shorts, "Lou" rests closer to the splendid "Sanjay's Super Team" and "Piper" than to the obnoxious earworm "Lava."